Cook the ground beef, canned chilies and taco seasoning in a skillet until beef is brown all the way through and the liquid from the chilies has evaporated. Place in refrigerator and allow to chill until completely cold. Then, place in an even layer on the bottom of a 9×13 glass cake pan. Top with a double layer of crisp, iceberg lettuce leaves (half the head), 1/2 cup of the ranch sour cream mayonnaise smoothed into an even layer, beans, corn, onion, another double layer of lettuce (press down gently after placing the lettuce,) the other 1/2 cup of ranch sour cream mayo, salsa, cheese, olives, bacon, jalapenos, tomato and a little more purple onion. 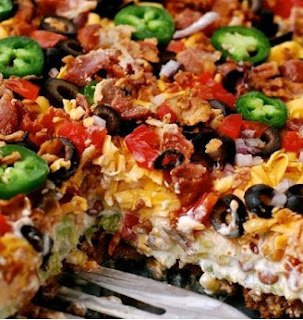 Place cover or foil on cake pan and refrigerate for 12 to 24 hours before slicing into pieces, crunching tortilla chips over the top, and serving. Feel free to top this with avocado chunks, extra tomato chunks, and your favorite hot sauce too!